You can block messages from specific email addresses or domains from reaching your inbox. 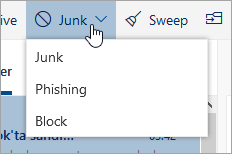 When you add an email address or domain to your blocked senders list, Outlook.com automatically moves messages from that sender to the Junk Email folder. In the message list, select the message or messages and then select Junk > Block > OK. If the email message is open in a new window, Block appears as an option on the top line. You can have up to 1,024 addresses or domains in the blocked senders and safe senders lists. If you want to add more than that, try blocking domains instead of individual email addresses. Open your Junk email settings. Under Blocked senders or Blocked domains, enter the email address or domain (the ending of an email address, such as outlook.com) that you want to block, and select Add. If you're receiving unwanted emails, you can add email addresses or domains to your safe senders list, and apply a filter to only receive messages from those senders. Under Safe senders, enter the email address or domain you want to add, and select Add. Email from addresses or domains on the safe senders list don't get moved to your junk folder. Tip: To edit or remove email addresses or domains from the safe senders list, select the item in the list and then select Edit or Remove . If you no longer want to block a sender, open your Junk email settings Under Blocked senders or Blocked domains, select the email address or domain in the list and then select Edit or Remove . Under Safe senders, enter the email address or domain you want to add, and select Add. To edit or remove email addresses or domains from the blocked senders or safe senders list, select the item in the list and then select or . To empty your Junk Email folder, select Junk Email in the left pane. At the top of the screen, select Delete all. 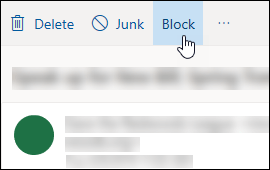 If you've blocked senders, but are still receiving mail from them, read Receiving email from blocked senders in Outlook.com.